The modern office is always changing with technology, but many of the components that make an office technologically modern and up-to-date are key to productivity in the 21st century. Productivity in the working world is dependent on a couple things: environment and resources. Of course, the individual worker needs to be motivated and engaged with their work, but the two variables of environment and resources are key factors in one’s capabilities. The space in which you work is important, and has a direct effect to your work. Think about it: if you’re in a crowded, unorganized space, you might not be as prepared for the busy work day as someone who is in an open space with all of their papers and files organized and put in their place. It’s not just a matter of cleanliness. To stay on top of the busy work day, you need to have things in order. If not, it’s likely that you’re going to lose track of clients, documents, and even worse, income or funds. The best way to control your environment is to organize it well and keep things in specific places. Modern office spaces need to manage their environment to stay on top of the work day. The saying goes “don’t work harder, work smarter.” That rings true in today’s age, and technology is making things easier for us if you know how to use it. Managing digital files and organizing information has never been easier thanks to computers, smartphones, and tablets. It’s not just computers though. Artificial intelligence is allowing us to have our entire calendars, schedules, and even emails constructed and managed for us. This doesn’t mean you can check out; rather, you now can have a personal assistant in your pocket on your phone, and even more, can be done from a tablet or computer. There are a number of reasons to access and utilize an AI system for your office, and in a modern office, it’s becoming a necessity. When creating a modern office, consider your resources available to you and what you need to acquire to make sure that you have what you need to make your office space modern. Why Modernize Your Work Space? These two variables are essential to a modern work space. But why modernize your work space? For starters, business is always progressing and moving forward. If you don’t keep up, it’s likely someone else is ahead of you and taking opportunities away from your company. The ways in which competitors gain traction over one another is often related to who is keeping up with technology. Technology is working for humans in ways that have never before been possible. The technology in workplaces nowadays is blazing trails for what was once considered improbable to accomplish in a small work space. Now, with an AI and proper modern office, one person could achieve as much as an entire office of people who don’t have access to advance technology. The quickest way to the top is to take tools and office essentials and implement them into your modern office in order to manage the constant changes. Let’s look at 3 keys to designing a modern office. First, starting with staying organized. An easy way to stay organized is keep things digital as often as possible. It’s much easier to manage files and documents as digital files than papers and folders. That being said, it’s nearly impossible to go completely digital and paperless. For those files you need to keep physically, look no further than the Filing Cabinet – The possibilities are endless with these dynamic filing systems, first and foremost due to their design. Under your desk, it’s likely that you keep cords and maybe a few stray items, but imagine having all of your spare papers and documents within reach of your normal desk positioning. These sit underneath desk and take up very little space. Don’t be fooled, however: these cabinets are roomy enough to hold your documents you need to keep safe and secure, but also close by in case you need to reference them. These sleek cabinets allow you to keep your documents organized without taking up the space they would if they were thrown all over your desk. The huge benefit of having a filing cabinet is the technology behind its construction. Cold rolled steel plates that have been superfine and manufactured to last combine with anti-rust treatments to make sure that your filing cabinet will not only work well but last as long as your business. There’s plenty of costs in the working world, you shouldn’t need to worry about a filing cabinet that may need replacing a few years down the line. These are built to last, and durable enough to endure your hectic schedule and work life. A big hurdle is finding a filing cabinet that has drawers organized to what you desire allows you to customize your cabinet to adjust the drawer dividers to fit your needs. If a larger base is necessary for larger items and taller filing systems, so be it. If you want a bit more of a symmetrical layout with even dividers, you can do that too. The organizing of your modern office should be up to you, and with these filing cabinets, you choose what goes where. Adjusting drawers are easy and take no time at all. It may seem silly, but visually, these drawers work for you as well. Their sleek design is only enhanced by a choice of great colors that help either illuminate your office space or keep it cool like your demeanor during a big meeting. Red, blue, gray, or green help color your cabinet drawers with a splash of something fresh for your eyes when it feels like you’ve been staring at a screen all day. Not to mention that if a sudden change is needed, this cabinet has wheels that can easily move your cabinet from one part of the office to another. Again, they fit under a desk, but with great mobility options, you can put this cabinet wherever you may please. A modern office needs to start by staying organized. Only then can you worry about other aspects of the workspace, like a 21st-century desk fit for a business professional. A desk is where much of your work is occurring in the office, so it’s important to find one that works for you. The best option you have is the Smart Desk 3. The Smart Desk 3 implements that important artificial intelligence, or AI, discussed earlier. The Smart Desk 3 comes at a price that is amazingly affordable for what it can do, and every modern office needs these features to ensure digital and electronic supremacy in the working world. If you don’t have an assistant, you’ll be shocked to find that many of the administrative needs one may have can be answered by the Smart Desk 3’s AI intelligence system. Reminders of when to eat, encouragement to stand and work for a bit, or even something as simple as a meeting or birthday in your calendar all come through your virtual assistant that is located in a tablet built into the desk. Your productivity is at its maximum with the Smart Desk 3, and you’ll never remember how you got along without it. The Smart Desk 3 implements a standing desk mechanism that requires no work on your end. An automatic motor allows for sit-to-stand adjustments to occur with the press of a button. Luckily enough, simple adjustments can be made and saved into the desk so that presets can allow you to choose your preferred height without having to mess with complicated settings. The Smart Desk 3 encourages you to stand and work, which is something you should be doing already. In an 8 hour work day, at least half of that time should be spent on your feet working, and that’s at a minimum. The Smart Desk 3 is your ticket to healthier habits and a more productive workday. Days turn into productive weeks, and productivity over long periods of time means success. With the Smart Desk 3, you have a guide and assistant into the world of a modern office and modern worker. With an affordable price and countless features, the Smart Desk 3 puts your office into the future, while also allowing you features of a traditional sitting desk. When you do want to sit, however, there are options for you to do so in the most productive way possible. Let’s face it, a long workday might mean you don’t want to be on your feet all day. That’s okay, and if you need to sit, it’s not the end of the world. But why not do so in a healthy, strength-building manner. The ErgoStool is your ticket to building strength while also maintaining healthy posture and building dynamic habits. For many of us, sitting includes leaning back or straining our neck, and over time, that can harm us. Why not have a manner in which to sit in a healthy and positive way? The ErgoStool allows you to build core strength and back muscles by sitting up straight without the support of a chair. While seated, you naturally wobble, which emulates the frequent posture changes we make while standing that naturally tone our muscles. A weighted base at the bottom allows for traction on various surfaces, meaning no matter if your office is carpets or wood, you can achieve your full range of motion while seated. The ErgoStool allows you to sit and adjust your height level while seated without lowering your desk. A 10 inch range of motion is available to you, and if you don’t have a height adjustable desk, this is your way to make sure you’re at a comfortable height. 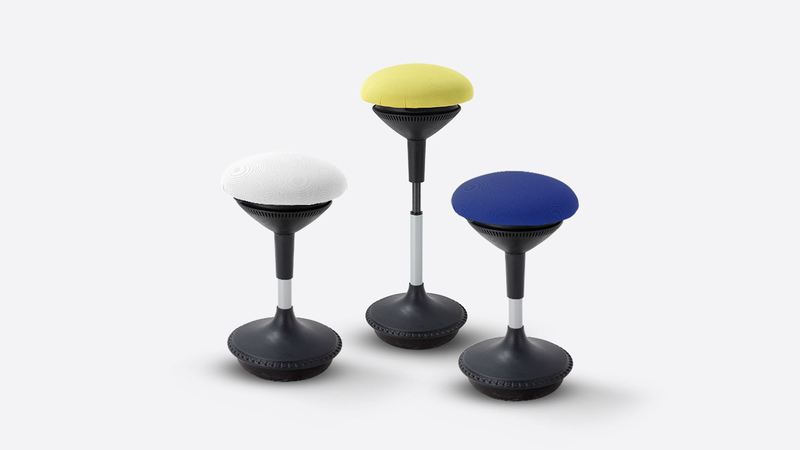 Even while seated, the ErgoStool allows you to stay gently active, maintaining comfort while encouraging your body to participate in proper circulation throughout your entire lower body. A quick easy break from standing is made easy and healthy with the ErgoStool, and for a cost under $100, you can get a seating option that is going to help maintain your health and well-being. When seated, your body needs to stay active, and that’s why the ErgoStool is an option meant to keep your body in tip-top shape. The best part is over time, the stool helps your posture in all seated positions, and even improves mobility and your range of motion while standing as well. A modern office needs to utilize modern science to determine the furniture and seating options, and the ErgoStool allows you the comfort of a place to sit while also building core strength. The modern office relies on technology and resources to maintain a positive, productive environment meant for the modern age. It’s important to keep up with business practices, but sometimes the edge comes from technology, not textbooks. Makes business and office furniture that employs the best of what’s around the technology world and implements it into your workspace for the better. These options you have are not really options; they’re your way to stay ahead of the game. If you’re serious about business, these are the tools you need to stay on top.